Easily absorbed, convenient one-a-day tablet which is gentle on the stomach. 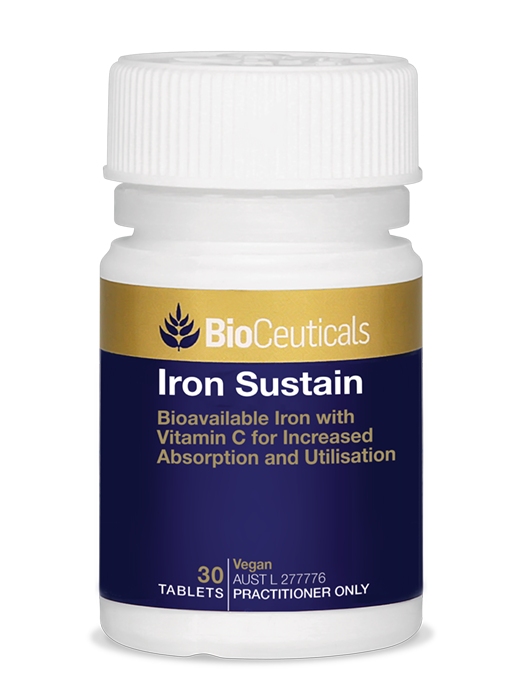 Iron Sustain provides highly bioavailable iron in the form of ferrous bisglycinate. Activated B vitamins and vitamin C support the formulation. 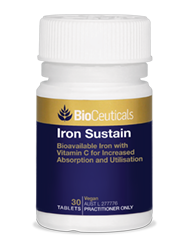 Iron may be of assistance to people with an increased demand for iron or whose dietary intake of iron is inadequate. Iron is necessary for the formation of haemoglobin in the blood, which transports oxygen to the tissues. Uses easily absorbed ferrous bisglycinate chelate (Ferrochel®). Provides 24mg of elemental iron. Includes activated B6, B9 and B12 vitamins. Iron, folic acid and vitamin B12 help maintain healthy blood. Assists normal red blood cell formation. Helps support dietary iron intake. Contains vitamin C to assist with non-haem iron absorption. Beneficial during pregnancy when iron need is greater.